Greece is a coastal nation comprised of a mainland section as well as numerous islands spread throughout the Ionian, Adriatic, Cretan and Aegean seas and is a favourite amongst holidaymakers throughout the world. The culture of Greece stretches back thousands of years and included a huge love of feasting and wines. 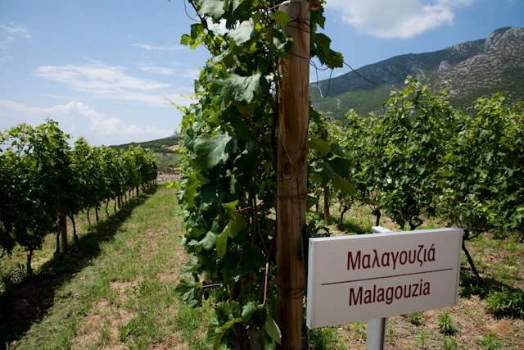 This love has extended into the present day and there are today numerous vineyards scattered throughout the country which produce some of the most vibrant Grecian wines that pay homage to centuries past. This grape literally means ‘sour black’ in English and is a popular grape for winemaking in parts of the country. This grape is grown in the Dodecanese island region around Naoussa but is also found on the mainland to the north in the Macedonian region, but is found in a number of other areas as well. In some regions of the country the wine is blended with other wines to create delicious and robust blends that have higher alcohol content. This variety is native to the island of Santorini, where it grows rampantly in the rich volcanic soil of the island. It can also be found on the island of Paros where the volcanic rich soil also provides an ideal growing climate as well as the island of Chalkidiki. This type of grape is ideal for blending into other wines and so it provides a great opportunity for blenders to try out new and delicious pairings. These grapes arr typically a very light yellow to white colour and it’s been noted that even if the grapes are extremely ripe they do not lose their acidic base, resulting in drier wines with a crisp and refreshing finish. The most widely planted grape in Greece this variety is also known by its English name of St George or Manvro Nemeas. This is a widely grown grape, being found in regions such as the Peloponnese in the Nemea area as well as in Attica and Macedonia. This means that the wines from this grape are common and widespread and easily found throughout the country. The grape can take on a number of different characteristics depending on how it’s grown and processed and so it results in a number of different flavours, textures and finishes for wines. It’s commonly blended with other wines such as Cabernet Sauvignons in order to create popular and widely consumed table wines. It’s an early ripening grape with most of its ripening happening after mid-September so it’s a great grape to have around to make wines for Christmas or into the next year. Spicier and slightly fruity in flavour, this particular wine is ideal served with meats of most kind. There you have a rundown on three of Greece’s most popular grape varieties and the wines they produce. Greece has enjoyed a rich and diverse wine culture throughout its entire history and it’s easy to see that wine remains deeply rooted in Greek culture and heritage. From the names of the grapes to the table wines they produce for parties and family dinners one can see how the grape and its wine remains a staple in Greek life.